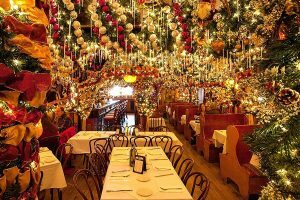 During the holidays, the inside of Rolf’s German Restaurant in New York City looks a little bit like a tornado whipped through Santa’s factory and left every Christmas decoration that exists inside. That’s because the famous watering hole gets totally decked out in100,000 lights, 15,000 ornaments, thousand of icicles, and about 800 dolls (yes, you read that right) each year. 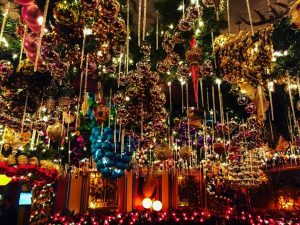 Which is why it’s a good thing Rolf’s doesn’t just celebrate a 25-day season: The restaurant gets a head start and starts decorating in September — and they keep it festive until April. Meaning if you can’t get a spot at the popular destination during Christmastime (the line to get in often wraps around the corner) you can catch it during the spring. French * German. French as in Alsace, and German as in Bavaria.Alsace has been much disputed by Germany and France. Even located in France for most of its history, is more reminiscent of the Black Forest across the Rhine River. Alsatian cuisine by overwhelming presence of pork, goose fat, duck, choucroute with sauerkraut, sausages, chicken, and trout gives a distinctive flavor. The romance between Alsatian and Bavarian Cuisine is indisputable. Christmas decoration will be on the display until the end of May.